Pegi Nicol MacLeod was born in Listowel, Ontario in 1904. She studied under Franklin Brownell at the Ottawa Art Association, then at the École des beaux-arts in Montréal, where she met her lifelong friend, Marian Scott. For the next few years she painted mainly landscapes in Ottawa and Quebec. In 1927 and 1928, she travelled to Western Canada to paint the landscape and people of the First Nations. 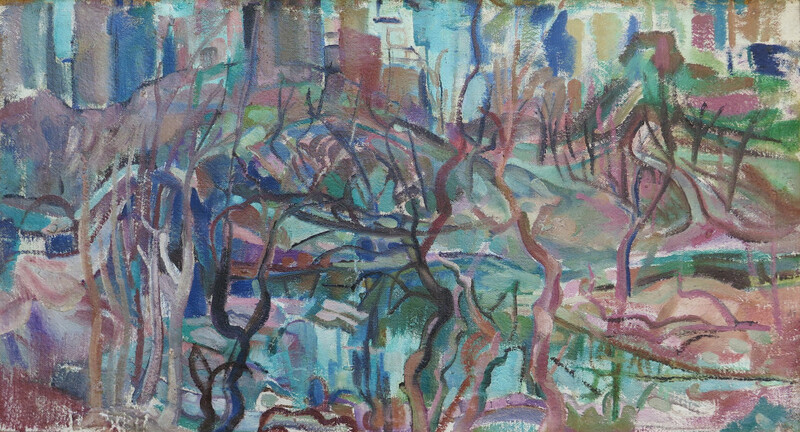 She won the Willingdon Arts Competition prize for painting in 1931. Pegi Nicol lived in Toronto from 1934 to 1937. When she married Norman MacLeod in 1937, she moved to New York City, where she painted the city's street life and numerous studies of her young daughter, Jane. Every summer she returned to Canada, mainly to Fredericton, NB, her husband's hometown, where she taught summer art courses at the University of New Brunswick. In 1944, she was commissioned by the National Gallery of Canada to paint the women's division of the Canadian armed forces. One hundred and ten of her paintings, watercolours and oils, are now in their war collection. In 1949, she died in New York City after an eight month illness at the age of forty-five. MacLeod belonged to the Canadian Society of Painters in Water Colour and the Canadian Group of Painters.